When someone mentions “the first Americans,” you might think of the Mayflower, pilgrims, Puritans, and Plymouth Rock, or other European colonists. More than 10,000 years before the arrival of the pilgrims, however, the “New World” was home to hundreds of tribes, speaking dozens of languages. The identity and culture of these first Americans has been subject to systematic discrimination and erasure. And, when acknowledging the experiences of Indigenous peoples of the Americas, even those with the best intentions can fall into the trap of oversimplification of these distinct and varied peoples. Students in Madeline Knickerbocker’s Indigenous peoples of North America to 1850 course this last fall sought to explore the diverse experiences of Indigenous peoples including their historical knowledge, their histories before contact with European colonists, and their interactions with the colonists. Lakota Parflech Displayed at the National Museum of the American Indian, Washington, D.C. Image: File:Lakota Parflech Displayed at the National Museum of the American Indian, Washington, D.C..jpg, Taoboy49, CC BY-SA 3.0, via Wikimedia Commons. Student work was expansive and diverse, exploring multiple facets of Indigenous life and culture. In total, students edited 51 articles, including four brand new articles. Some students focused their contributions on the crafts and clothing created by various tribes. 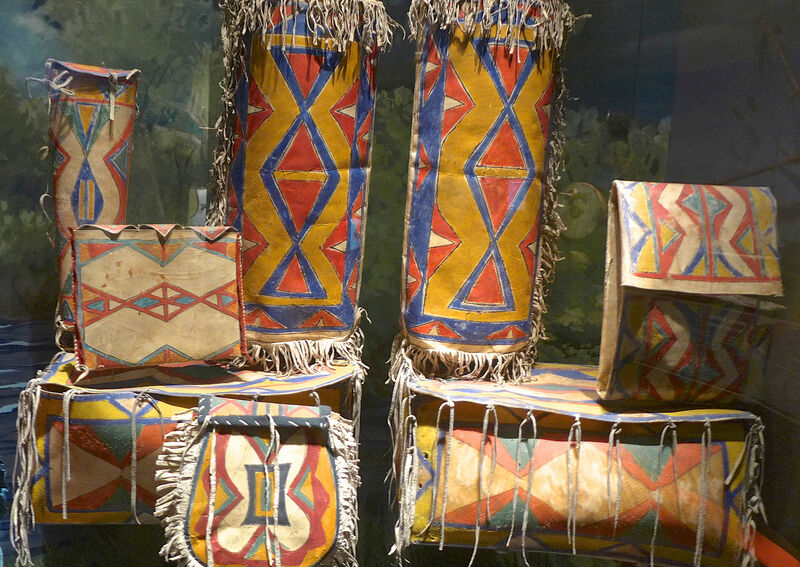 In the Plains tribes, the most talented craftswomen created guilds to teach their skills to the next generation. They created parfleches, or rawhide storage containers, decorating them with bold designs that may have also functioned as maps. The Unangan peoples of the Aleutian Islands created elaborate wooden headgear to be worn by their hunters. This headgear, known as Qayaatx̂ux̂ or Chagudax̂, communicated the status and skills of the wearer: A closed crown of the hat indicated higher status, such as that of a chief, while an open crown was indicative of lower social standing. The headgear was adorned with sea lion whiskers—the more whiskers a hunter accumulated, the more obvious his skill as a great hunter. Image: File:Hunting hat, Aleut – Etholén collection, Museum of Cultures (Helsinki) – DSC04917.JPG, public domain, via Wikimedia Commons. 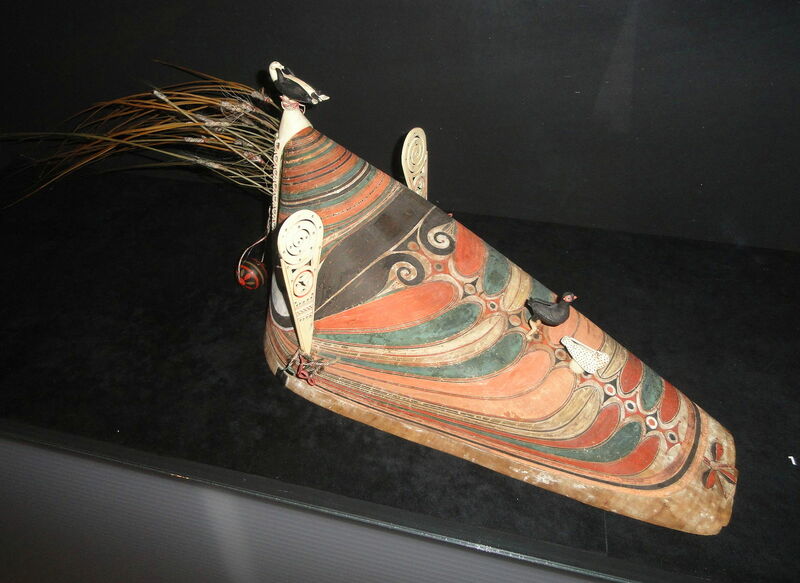 Students noted that both the hunting headgear and the parfleches are displayed in museums around the world, raising difficult questions similar to those posed to European museums possessing stolen African cultural artifacts. Ethnographers “studying” these peoples would even steal artifacts from their sacred burial sites, prompting one German museum to return some such artifacts to the Chugach tribe last year. One step toward counteracting the erasure of indigenous histories is to put them forth on the most-accessed collection of free information: Wikipedia! Thanks to these students at Simon Fraser University, we’re a bit closer to knowledge equity. Interested in teaching with Wikipedia? Visit teach.wikiedu.org for all you need to get started or reach out to contact@wikiedu.org with questions.